This cake was designed after the lovely Carla Thomas, of Carla Thomas Photography contacted me about designing a cake for a Titanic themed shoot. One of the perks of being a London wedding cake designer is being able to get involved with so many creative talents. The shoot was to coincide with the 100th anniversary of the voyage’s demise, and was complete with era appropriate dresses! The brief was brief (see what I did there). Just simple and white, to match the Victorian style of the shoot that was actually going to be on board a boat! When I though about the design the first thing that came to my head was lace. And I did really think about lace. There are a number of lace moulds on the market that are very popular, but as much as I think they make for very pretty cakes, it doesn’t look like lace to me. 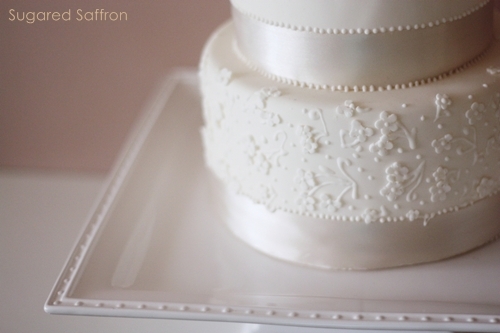 There’s always the option of using real lace on a cake. For borders I think it can well but strewn all over reminds me of an old granny’s curtains. 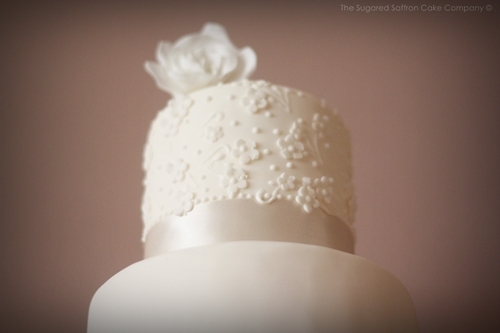 The most realistic method for producing lace effect cakes is no doubt Sugar veil. It’s a very unique product, and the effects you can get with it are incredible. Some decorators struggle getting to grips with it whilst other use it on every other cake. It seems like one of those products which splits opinions amongst sugarcrafters. Although display cakes are the perfect way to practice new techniques, I only had a couple of days and a severe case of tonsilitis to contend with so sugar veil was a nono. 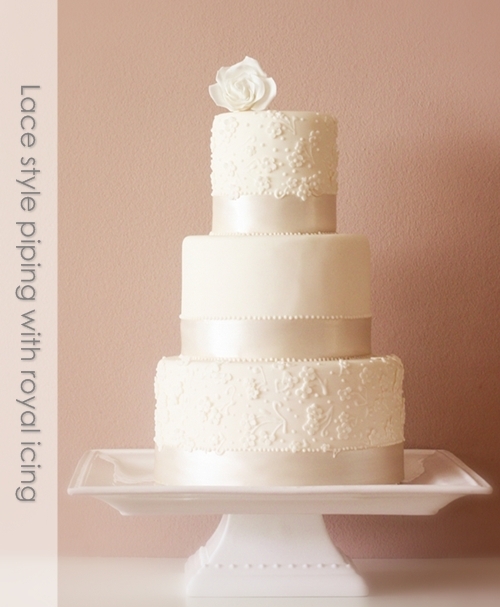 The bottom tier of the lace style cake, with blossoms and royal icing piping. For me the idea of simple piping with small blossoms has a fabric-y feel to it. Don’t get me wrong, I wouldn’t say it was lace effect, but definitely lace style. Its simple, without being a just-throw-a-ribbon-on-it kinda job. The shoot was featured on the Want That Wedding blog. I wonder if will anyone will notice the difference between the photos here and on the blog. The cake for the shoot was actually four tiers. A while later I played around, took the bottom tier off and placed a rose on top. I think I prefer it this way. I can safely say this, between the writing& the gorgeous pictures I was sorely disappointed that the blog has only just started. If I could have kept reading, I would have. You’re a wonderful cake designer & I’ve been aspiring to do the same thing myself, there isn’t much of a scene for it in Athens though. Still, I’m very happy that you stumbled across my blog because in turn I got to see how fabulous yours is. Thank you for sharing & i can’t wait for the next post! Thank you for such a beautiful comment Lauren 🙂 I love your blog so you comment means so much more! Thanks Nancy 🙂 I like to pretend I’m stylish.